Quazarz: Born on a Gangster Star and Quazarz vs. The Jealous Machines will be available worldwide July 14th. 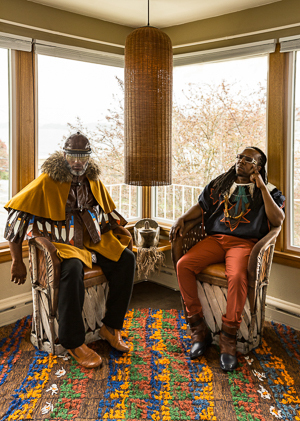 Shabazz Palaces have another track to share: “Since C.A.Y.A.” is an elastic and transportive selection from the group’s forthcoming Quazarz: Born on a Gangster Star – the extra-spatial twin to Quazarz vs. The Jealous Machines – available July 14th worldwide from Sub Pop. “Since C.A.Y.A.” features dazzlingly funky bass licks by the magnificent Stephen “Thundercat” Bruner and was produced by Knife Knights (aka Ishmael Butler and Erik Blood), recorded and mixed by Blood at Protect and Exalt Labs: A Black Space in Seattle. Quazarz: Born on a Gangster Star and Quazarz vs. The Jealous Machines will be released on July 14th on CD / LP / DL / CS and are now available for preorder from Sub Pop right over here. LP pre-orders for each album from megamart.subpop.com and select independent retailers, will receive the limited “Loser” edition on colored vinyl (…Jealous Machines on mashed-up purple; …Born on a Gangster Star on aluminum). Both albums can be purchased together as a special bundle, and there are also new T-shirt designs associated with each release (one for …Born on a Gangster Star and two for …vs. The Jealous Machines) (read more at Sub Pop). 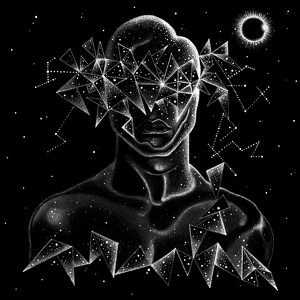 Shabazz Palaces will support both Quazarz: Born on a Gangster Star and Quazarz vs. The Jealous Machines with North American tour dates that resumes July 13th-16th at Cascadia Festival in Granite Falls, Washington and run through September 15th-17th for Chicago’s Riot Fest. Additionally, support for these shows (August 16th-September 9th) will come from labelmate Porter Ray. *Excerpt taken from the essay “The Diamond Skinned Don: Reconstructing Quazarz and the Seven Proofs of Flight” by Lou “Loud Eyes” Monk published in the Purple Cliffs Quarterly from Moon Whip Press © 2064.